The Pakistan Telecom Authority (PTA) organized an IXP workshop in collaboration with the Internet Society on 22-23 August 2017 in Karachi, Pakistan. 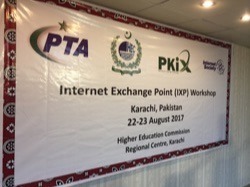 PTA along with other stakeholders that include the Higher Education Commission (HEC), ISPs and mobile operators, is currently raising awareness of the successful deployment of the PKIX – Pakistan Internet Exchange node in Karachi after the success of the Islamabad node that was launched earlier this year. PTA organized an awareness session with all ISPs and mobile operators in Karachi back in February 2017, where it was agreed that a technical session was required for all the members in Karachi. During the same session, ISOC offered to provide the IXP equipment to encourage participation, and has arranged to ship switches and servers that should be received during the first week of September. 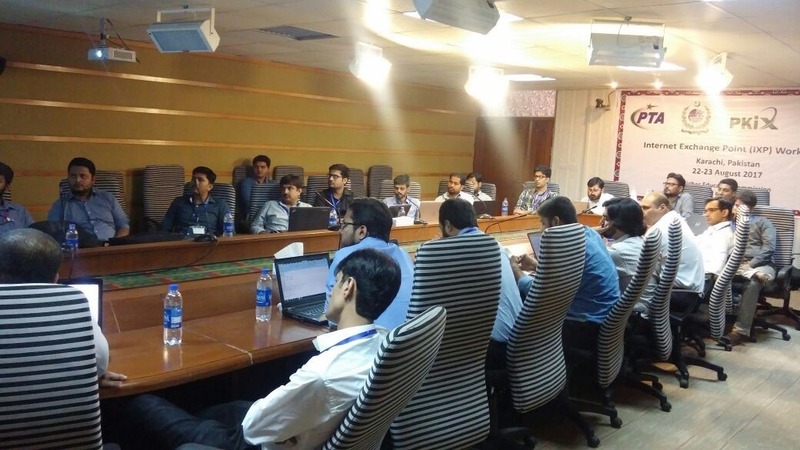 The two-day event was hosted in the HEC Karachi office and was attended by 23 participants from the Internet. Our Deploy360 and Asia-Pacific Regional Bureau colleague Aftab Siddiqui also conducted a workshop to ensure all participants understand the importance of the Internet Exchange and how to make the best use of it, as well as to train engineers in order to help support the IXP operations moving forward. Participants made full use of this opportunity and it provided to be very interactive. The PKIX Board has also offered the possibility for all the workshop participants to be part of the design and deployment team of the Karachi node. At the end of the workshop, certificates were presented to the participants by the Director of the PTA Zonal Office Karachi Mr. Akhlaq Hussain Musavi, Director of HEC Zonal Office Mr. Javed Memon, and Deputy Director Mr. Naeem Bhutto.